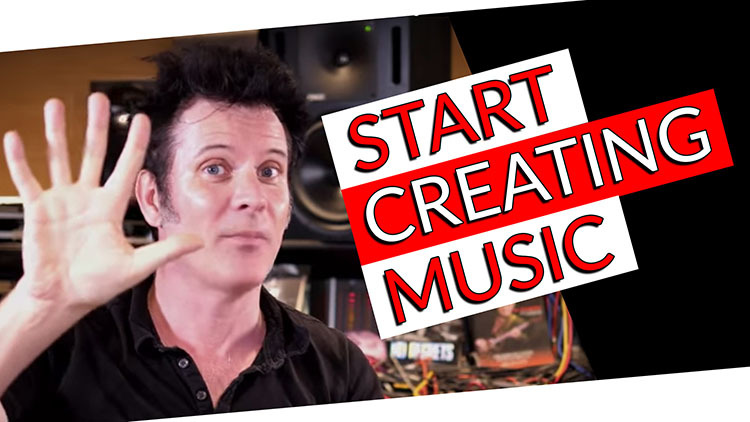 In this video, we’re going to be talking about 5 tips to get your creating music. 1. Just get started! Don’t ‘wait for inspiration’. Set aside time to work. Many people have full time jobs, are in School or are looking after kids! There’s many things that take our time! So set aside time in your life to make music! Even 45 mins can be enough time to started on a great idea! I know that sounds silly I used to wait until I was “Inspired”. When I did that I would probably make music every several months. Now I. Have a really busy life and I just set aside time to make music. I’m not just talking about working with artists, playing guitar, playing bass, doing overdubs, mixing I’m talking about music. I like to make music I got into. This to play guitars, I wanted to be Brian may – it’s pretty obvious. I wanted to be in a band and make music when I want to write a song I have to allow some time. Sometimes I don’t have the faintest idea of what I’m going to write but I just opened a session and start making music. I honestly believe that waiting for inspiration to hit will stop me from ever making music. I allow that element of second-guessing every idea I have. Maybe I’ve got a guitar part I’m not sure about and I’m starting to write something and I’m thinking is it good enough, I’m not sure, maybe I’ll come back tomorrow, it’s just not the way to work. Just set aside time, so many of you may be at school with long hours at that and then come home and have homework and you’ve got a limited amount of time to work on music. Other people are married with children, single parents with kids. or you’re somebody who has some ridiculous 15 hour day job. There are all kinds of stuff, with that reality just set some time aside for what you know you can do. The reality is that about 45 minutes of real music making happens with me. And then need tome on to something else. If I have an idea I want to put down or want to think one too put down. I’ll mess around on guitar for 5-10 minutes I’ll come up with something that’s kinda cool and then I’ll put a double to it and then maybe I’ll work at a harmony part, put a baseline down and strum some cords to it and maybe sing a vocal melody. That is about 45 minutes work which I can put down till the next day and come back the next day when I have an hour to spare and listen to what I’ve done and work on it then. Maybe you start working on some lyrics. The point is it’s about how much actual time together you put into it. If it ends up that you work on it 10 times for 45 minutes that’s a lot of time. So cut yourself a break some of the greatest songs were written in 2 minutes, and some of the greatest Wong were written in 5 hours and 5 years there are no rules and that is the point. Set aside some time and write that idea, get down there get stuck into it, find some time in a busy day and just make music. 2. Be ready to make music at any time! Have your set up ready to go! Have a mic plugged into your Interface, have your USB Keyboard plugged in, have a mic in front of your guitar amp or a DI ready for your Guitar or Bass! Why am saying that? In the first tip, I said to set aside time and don’t only record when inspiration comes. And then inspiration may only come once a month where some amazing melody flies through my head. What happens then is I reach for my phone and go to the memo and I sing the idea in or I play the guitar part into it. The point is to be ready to record because inspiration is kinda weird and you can wake up at 4:00 in the morning humming a melody pick up your cell phone and sing it in there. There is a really famous story that you may have heard a 100 times before, Keith Richards supposedly wrote satisfaction like this. I think he was playing a show, after the show he got wasted drunk and he used to always tour with a reel to reel tape recorder, the story goes that he wakes up in a drunken stupor at like 4 o’clock in the morning, picks up his guitar and. Plays one of the most famous guitar riffs of all time. He wakes up at 10 o’clock in the morning looks over and his reel to reel tape was spinning so he spooled the tape and played it back and it is him playing followed by the sound of him falling back to sleep. My point is even Keith Richards could have lost that guitar part we would not have had satisfaction. He had a reel to reel, we have cell phones, tablets, laptops. The point is to be ready to record at any time. We can take that one stage further, have your setup, your laptop, your computer, whatever you use just have your interface plugged in so it’s always ready to go, and a microphone patched in. We usually have a microphone sitting on a stand over that is powered up and ready to go and I can pull that out at any time and plunk it in the middle of the room, or just press record on the channel it’s coming into. Why do we have that? Well, it’s because we are always writing songs in here. If you’re a guitar player and you have an amp, have the amp mic’d up. Have your little USB midi controller always plugged into your interface, always ready to go just have something really really simple that you can always get started quickly. Be ready to record and quality doesn’t matter, getting the idea down does. If all you’ve got is a laptop, all you’ve got is a cell phone, whatever it is just record it and get the idea down. If you do have a studio set up ready to go, have it ready to go so you can get to it pretty darn quickly. 3. Listen to other genres other than the one you normally work in. Other genres will inspire you to bring in new influences they will also take you out of the generic if you’re only listening to the same genre you’re creating! Listen to other genres outside of the genres you work in, this is really big because it’s actually very obvious if you think about all of the great music made back with the earliest form of Blues and Jazz. Those were African Americans in the turn of the last century that were taking their African tribal music with European music and instruments, creating something completely unique. The Blues and Jazz mixing in some classical and stuff is what inspires us to make music, obviously, folk music is where county comes from. When I think of my upbringing and the bands that I loved when I was a kid they were all English guys like me trying to sound like black blues guys. My point s you always take from other great things. To me, if you don’t know who Robert Johnson is you shouldn’t be doing music, Robert Johnson wrote a handful of songs which have been covered by every single amazing musician ever. Half of the stones catalog so far feels like that level and Zeppelin and everything else. All of these artist influence so much of the music we do, throw in some Hendrix and some Miles Davis and all of the B-Bop. Its some of the greatest music but rock and roll and country is a blend of all of those things. I don’t understand what anyone turns themselves off from anything, I don’t care if its EDM or Metal they all make sense. Gain perspective, listen to other genres, listen to other stuff, don’t block yourself out. You can back to the oldest of the old, The newest of the new everything in between but always be looking for other things outside your very narrow world that we all fall into. Look outside of it for inspiration. These tips are all ways for us to make music they don’t have to run concurrently they don’t all have to work out the same time. If the only way you record ever is to flip open your laptop plug in your USB Keyboard, search for a loop, put the loop across, start, copy and paste. If that’s what you do…great. Next time you pick up and start Working on a song don’t do that, do something different, find a different source. The point is to break up the monotony of what you do, get creative and think of a different way. If you’re always starting with the drum loop and then building tracks on top of it, start with a piano vocal, or an acoustic guitar with vocals and work backward. There are a million ways of doing it if you have one way of working to try something different. Also gear, gear is a big one do you always use this, go through that and use that mic….I fall into that trap all the time. I was doing guitars earlier today and it was the best guitar sound we’ve had for months, you know I don’t want to change it, but what am I going to do, record the next 5 albums with exactly the same guitar sound. – that’s just not the way to think. I can change up the guitar the mic-pre the compression, the point is I need to get out of the comfort zone so I can create something that is really great. Repeating yourself is not going to give you the greatness that we all are looking for. Whether it be gear or how you start recording or what the normal things you do are, change them up. – Do something different! 5. Try writing on an instrument that isn’t your main instrument. For me that is the piano, I’m a really good guitar player, I practice all day, I love playing guitar. Put me on a piano and I’m plinky-plonk, but I write really good songs on the piano, a couple of my favorite songs I’ve written were written on the piano because I play very simple things and think differently. An old album I discovered when I was a kid, After the gold rush by Neil Young, the story goes he hire Nils Lofgren, who I think at the time was only about 18 years old. Well Nils was a Phenomenal guitar player, he was in the E Street band for a while he played in crazy horse with Neil Young, and he’s also an amazing singer. Neil Young hired him as a piano player. I think that is a great illustration about taking yourself out of your comfort zone but also how as a writer limiting yourself can really create greatness. Create these things to push against, It doesn’t have to be if you’re a guitar player you have to play piano, or a piano player who plays guitar, just try a different instrument, try a different approach get creative. Creativity is all about being creative!